New Sparks mayor Ron Smith has always been passionate about the City of Sparks – and politics. 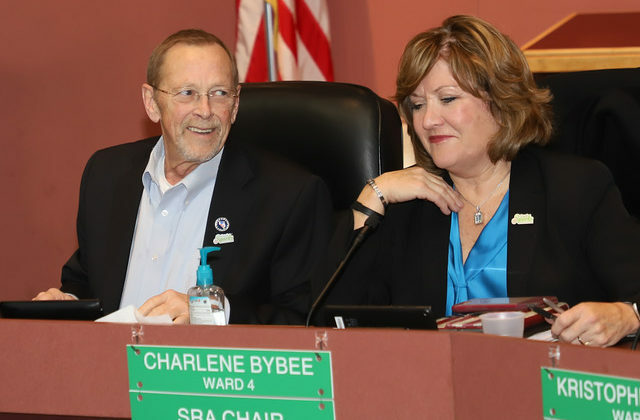 After spending the last 12 years on the city council, that passion has guided him to his new position of leading the city he has lived in for the last 44 years into the future. New Sparks mayor Ron Smith and councilwoman Charlene Bybee share a laugh at Monday’s city council meeting. Smith attended the meeting despite his recent diagnosis of pancreatic cancer. However, just two months into his new role, the Sparks mayor released a statement last week announcing his diagnosis of pancreatic cancer. Despite the announcement, Smith attended Monday’s city council meeting and remains optimistic that he will not let that get in the way of serving the city. Originally from the Bay Area, Smith used to vacation in Northern Nevada and go on hunting trips. Working in the grocery store business, he went on one two-week hunting trip with just his dog and ended up getting a job at Albertson’s off Oddie Boulevard and moving to Sparks for good. Over the next four decades, he worked at Albertson’s and later Scolari’s while also getting involved with what was going on in his neighborhood. “I’ve always been interested in politics. I did my homework and got on the Homeowners Association Board at the Vistas. One resident called me and asked for my opinion on certain issues and I never thought anyone would come to me about things like that,” he says. During his time in serving on the HOA board, Smith pushed to bring in a management company for the Vistas and refunded past resident HOA fees believing that they were a bit over-inflated. Next he moved over to D’Andrea and became involved with the HOA board there. For Smith, a politician being involved in the issues and learning/acting on the issues affecting his community early on is an important trait to have. “For anyone interested in running for city council or any other political office should start going to the meetings. That will give you a big indication on whether you want to pursue that or not,” Smith says. Plus, it shows that you truly care about your community. “I’m in it to win it, not just get my name out there,” he says. Smith was first elected to the Sparks City Council in 2006 representing Ward 3 and then took over Geno Martini’s city council seat in 2008 when he became mayor. Smith ran unopposed in 2012, the same year that he received the Public Official of the Year award from the Builders Association of Northern Nevada. He was then was re-elected in 2016, serving a total of 12 years on the city council. He spent the last few years as mayor pro tempore, designated to that role from Martini himself. “Geno’s a good man and a good friend,” Smith says. “It was always part of my plan to become mayor, but I’ve always supported Geno in what he wanted to do,” he adds. Smith has always been proud to serve with his fellow councilmembers, believing that everyone does their homework and continuously makes good decisions that benefit the City of Sparks. “And when the vote is taken, then I’m on the side of the winners,” he says about putting his personal opinions aside when an issue is voted on. “It’s all about the city and we all work together as a team towards its success,” Smith adds. Smith says that due to his role as mayor pro tempore for the last several years, the transition into his new role has been pretty seamless. “I still sit down one on one with the city councilmembers and push for being open and transparent in our communication. That’s what Sparks is and what it will continue to be as long as I’m mayor,” he says. However, while Smith hasn’t experienced any drastic changes going from city council member to mayor, he does miss voting on issues. “The biggest difference (of becoming mayor) is that I don’t vote anymore, I just have veto power. (In the city council meetings) I keep reaching for the button (to vote) and there’s no button there,” he says. Being involved so long with the city council, Smith recognizes the community’s challenges moving forward. “Our biggest struggle is that we’ve always been family-oriented, but with the population boom it’s hard to keep that family-centric atmosphere. But our future is the brightest now more than ever, and if you live here in Sparks then you’re in good hands,” he says. Always supporting infrastructure and transportation needs, Smith has not been afraid to take on some of Sparks’ biggest issues. “We need to fix the Spaghetti Bowl, widen Pyramid Lane- Sparks is at the tip of the TRI Center (Tahoe Reno Industrial) with Apple and Tesla, so we’re trying to put together packages for affordable housing, provide quality homes at a steady rate,” Smith says. However, he’s confident in the council’s ability to make the right decisions as they’ve done in the past. “The council I have really does their homework. Ask anyone who the leaders in the region are and if they’re being honest then they’ll tell you that it is the Sparks people,” he says. When asked what kind of legacy Smith wants to leave as mayor for the City of Sparks, he’s stumped. “I haven’t even thought about it; I’m not really looking for a legacy as being mayor, I’m more concerned about what the legacy is for Sparks after I leave office. When the city councilmembers have good ideas, they get the credit. And it takes a team to get everything done,” he says. He reiterates that he’s in this role to serve the City of Sparks, he loves his job, and that he doesn’t plan on stepping down any time soon. “It’s the reason why my (campaigning) sign never said, ‘Ron Smith- Ward 3’, it said ‘Ron Smith- Serving all of Sparks’. I think politicians these days vote more on what they want ahead of what the constituents want, and that’s not right. You were elected to make decisions on behalf of everybody,” he says. Being in a political office, Smith notes that he’s been faced with some tough decisions and it’s important to stick with what’s right and what best benefits the people. “I think people respect you when you’re honest and follow through on your promises,” Smith says. Being promoted to mayor of Sparks has been bittersweet, though, considering his recent diagnosis. “Having a positive attitude is a big deal- my surgeon said that his other patients with the same symptoms as me have stayed alive 5-6 more years. I expect to fulfill my term and be there. And the outpouring of support from the region has been amazing,” he says. “I appreciate the confidence in the people to continue to do my job. I still come to work every day, and if I have to change an appointment with you then we do our best to make it up. I love what I do and will continue to do it,” Smith says.